There’s been a major development over the past 24 hours: another member of Congress just came out in support of the House Congressional Review Act resolution to overturn FCC Chairman Ajit Pai’s net neutrality repeal. This is a big deal and could help push other lawmakers do the same, but we have to act fast because the deadline is just over a week away. Today is a massive day of action to show lawmakers that people still care about net neutrality so we’re asking everyone to click here and tell Congress not to let their chance to save net neutrality slip away. We’ve been fighting for months without seeing any movement in Congress, watching the clock ticking down to the deadline. But Rep Joe Morelle (NY-25) his support for the Congressional Review Act (CRA) resolution could change that. If we act fast, we can leverage this new momentum to unleash a small landslide of other representatives coming out for net neutrality before the December 10th deadline, which will make a huge difference in the battles ahead. Today we’re asking the entire Internet to sign this open letter to Congress telling them to do the right thing and support net neutrality before it’s too late. Your voice matters. As part of today’s Internet-wide day of action, thousands of others are speaking out, along with celebrities, musicians, and platforms like Tumblr, Postmates and Etsy. You can join them and show your support for net neutrality by submitting an ‘I support net neutrality’ photo. We will be flooding lawmakers’ social media feeds with pictures, so if they decide to vote against the open Internet we will make them look us in the eye as they do it. We can’t let this deadline come and go without making Congress remember that the whole Internet is watching. We’re still fighting for net neutrality. And we won’t forget if they betray us. 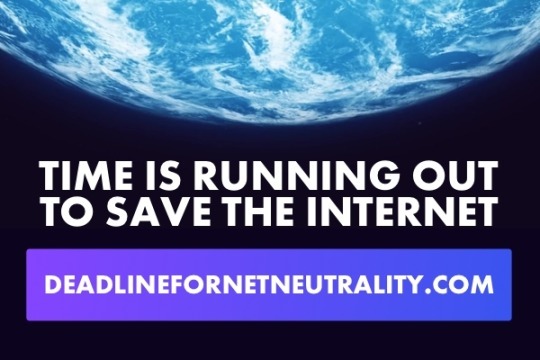 Tell everyone you know to take action at DeadlineForNetNeutrality.com and spread the word any way you can. Click here to find ideas on how you can use your slice of the Internet – whether that’s your Tumblr blog, a website you run, or any of your social media accounts – to help get the word out. We’re counting on you!